Buying a GoPro in India is a tricky business. So far GoPro didn't have proper presence in India- one had to either buy online from GoPro.com website, pay for shipping and customs, or buy from unknown sellers who have listed them on marketplaces like Amazon/Snapdeal/Flipkart etc. Recently a Chennai based company called Steriovision seem to have taken India distributorship of GoPro. They have appointed a series of stores in major Indian metros who sell these cameras to end customers. Purely out of curiosity, I visited one such GoPro dealer store in Chennai today. This post shares my finding. I visited a store called ADNT Rathna, a multi brand camera store in Vadapalani, Chennai (Opp Vadapalani bus stand, Doshi Garden building, First floor, D Block. I had to leave the footwear outside and go inside. As I walked in, I first asked about the warranty. I mentioned the case of my 3 Way Mount broken hinge and I was told that Warranty claim is entertained (for one year), but only for products purchased at their store, not for ones bought online, not even for ones bought on GoPro.com official website. (I will write separately about my Warranty claim experience with GoPro). Then I asked if they have latest Hero 4, I was told 'YES', priced at Rs 44000. (International price is USD 500, which is about 31000 INR, but similar to my purchase [detailed here], GoPro India distributor's official price includes customs, shipping, their profit margins and warranty. This defines their much higher pricing compared to unknown sellers online, who won't entertain warranty and we don't know if they got the camera legally into India. Similarly, most of the other GoPro products and accessories, such as mounts were available with the dealer, but for a price tag which is much more than what online stores sell or what it costs on GoPro website. While I was at the shop few calls came, prospective customers were quoting flipkart and other online site rates and questioning why the dealer rates are very expensive. While I was having a look, I spotted this Gimbal. I was told this is an accessory that can eliminate shaking while shooting using GoPro (or other camers for that matter). Most of my videos had lots of vertical and horizontal shaking, making it difficult for the eye. This GoPro Gimbal converts horizontal and vertical movement into sort of circular movement around the camera, this eliminating abrupt vibrations. I gave my GoPro and asked store owner to demonstrate, he tried but failed. But he demonstrated the function of Gimbal by attaching his phone to the same. I was told the cost of this Gimbal is Rs 22000, almost as much as the camera itself, so I stopped thinking about it. Store owner didn't permit me take any videos of the Gimbal, as if it is a top secret. Anyway, you can watch the video below that explains the functionality of Gimbal. I asked if there's anything that can help GoPro take better pictures at night. I was told some LED kit is available, but they don't have stock. This one reportedly costs about 4000 Rs. ADNT Ratna store also had Phantom Drone, for a price tag of cool 1.3 lakh rupees. I asked how may units of GoPro are getting sold every month. I was told they are targeting corporate firms, event management companies, sports organizers etc, who are buying these in good numbers. Few individual enthusiasts are also coming forward. Option 1: If you have someone coming from US, get it from there. You will pay much less, save on shipping and customs. Option 2: If option 1 is not viable, then you need to decide between an official re-seller or unofficial online re-sellers. 4 months ago, I ordered directly on GoPro.com, paid shipping and customs. This option can now be eliminated, because if you factor shipping & customs, the final cost comes almost same as what GoPro resellers are quoting. You might as well walk into a shop and pickup one, instead of ordering online and waiting for a month. But fact remains that GoPro india official re-sellers are as much as 50% expensive than some of the online rates, with only difference being 1 year warranty and assurance of genuine product. At times, it could be worth buying the cheaper one online and take chances that it will not go bad within warranty period. 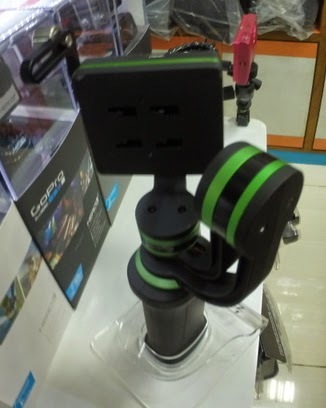 Store staff refused to give me a price list for GoPro accessories, but I have it from their distributor. I can send it if required and thinking if I should publish it here. Update: ADNT Rathna won't service/entertain warranty on a selfie stick: I had bought a selfie stick from ADNT Rathna last November, but within 3 months one of the levers broke and it became unusable. When I went to their shop again, they refused to entertain any warranty. I was asked to come back after one week, during which the device was returned as is, without any service. Given that their prices are almost twice as expensive as online stores, I do not have any motive to buy from them if they are not giving any service or warranty. I will take my chances with online stores. It's much better to ask someone from the us to get a gopro for you will save almost 180 USD that's a lot a lot of money that can be used to buy mounts and accessories without which gopro moments cannot be enjoyed! We claim for you. Any products under warranty can be claimed. This post is 2 years old. The price list I have is not relevant anymore. Also GoPro has presence in more shops now and more models on offer- do visit any shop in your city.